The cumulative adventures being had on motorcycles around the world at any given moment is tough to track. From solo explorers to multi-rider excursions, there’s always somebody out seeing the world through fresh eyes on their motorcycle or scooter. Turns out a bike can move body and soul far into parts unknown. One such adventure happening right now involves five Chicago locals. 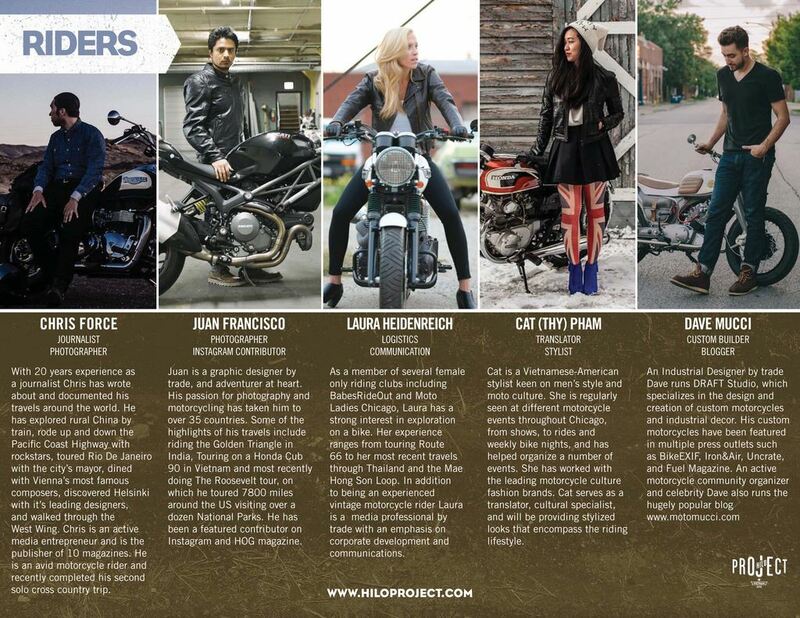 The HILO Project kicked off just a couple days ago and includes five Motoworks Chicago customers off on an epic adventure with one of our favorite brands: Ducati. That’s Ducati Vietnam, though, to be specific. HILO Project will see these four riders — Catherine Pham, Laura Heidenreich, Chris Force, Behind the Moto contributor Juan Hernandez, and Dave “Moto” Mucci — riding various Ducati motorcycles from the top of Vietnam to the bottom over the course of several weeks. The ride is meant to celebrate Ducati’s relatively recent expansion into Vietnam, to celebrate Ducati fans who live in Vietnam, and to help celebrate the recent launch of the new Ducati Scrambler. The core team of five American riders will be joined along the way by local diehard Ducati fans, local motorcycle-loving celebrities, and local luminaries such as the Italian ambassador to Vietnam. Spanning a total 19 days, the trip will take its time to see the beauty and grandeur of this infamous country and enjoy the hospitality of its people. Best of all, HILO Project is sharing their adventure in real time via their website, Facebook and especially Instagram. HILO has its own Instagram feed, but we’d definitely recommend following each rider’s individual accounts as well, as that’ll give you their individual POV closer to in real time.